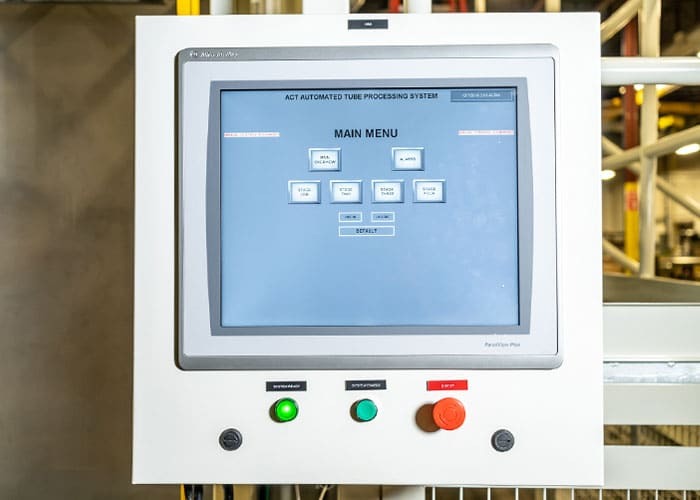 ACT custom programming can be utilized in order to make your industrial cleaning system either semi-automated or fully automated. Advanced Robotics can also be set up and streamlined through one of our user-friendly HMI displays. ACT creates and delivers purpose-built and custom single and multi-stage cleaning systems with PLC automation. We will work closely with you to develop a comprehensive solution to meet your needs, from stage-by-stage data logging and receipt processing to robotic work cell integration with SCADA management and control. Using Allen-Bradley, IDEC, National Instruments, Eaton, Schneider, Siemens, ABB and other industry proven technologies, we can create user-friendly programming and HMI displays that can be viewed and controlled via internet gateway from anywhere in the world. ACT can develop robotic work station design and turnkey cells that are fully integrated, pre-configured solutions for even the most complex cleaning or processing systems. Our programming can integrate with the latest industrial process and material handling management systems. For our smaller single stage cleaning processes, ACT can replace timers, relays, counters and heating controls with programmable smart relays with intuitive interfaces for easier operator control. Using PLC system programming your applications are more effectively processed, TAKT time is minimized and system ROI significantly increases. Contact us today and an ACT sales engineer work with you to develop an industrial solution supported by our extensive custom programming expertise.